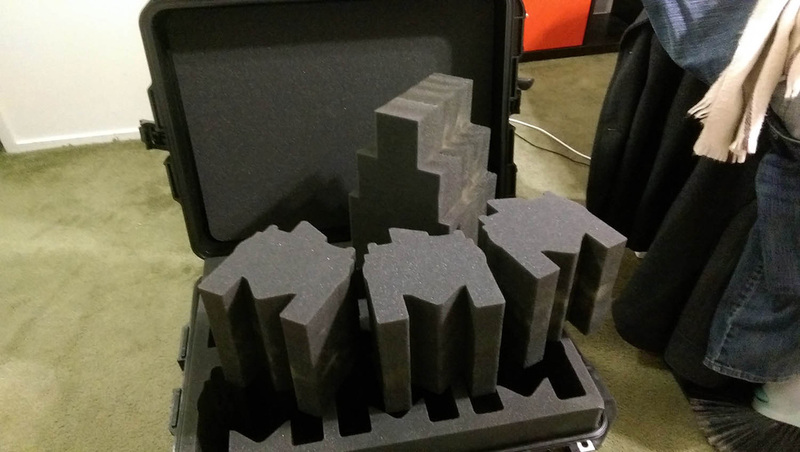 So you finally decide on the list you're going to bring to the tournament. 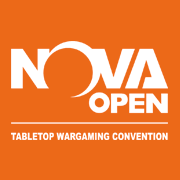 You've planned it, battle tested it, and got it painted to a standard that you either love or meets the standards of the event. But you've got a problem. 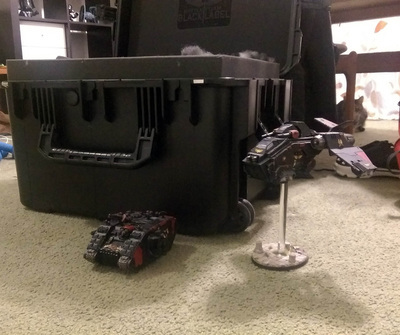 How do you transport your army when it won't fit in carry ons, and there is no way to drive it to the event? This is the situation I ran into. 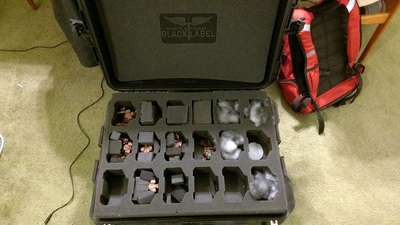 I looked around at a variety of solutions, and almost all of them were designed to allow YOU to safely transport your army, not allow a bunch of baggage handlers throw your transport case off an airplane and miss the baggage handler. This is not easy to transport! 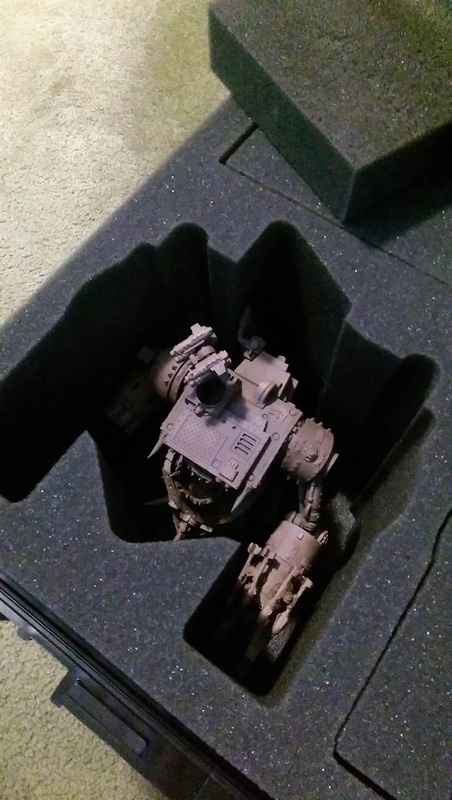 I also had the issue that my army list included a Stompa, which is roughly 10 inches tall, and around 7.5 to 8 inches wide/tall. And that's if you magnetize the limbs! 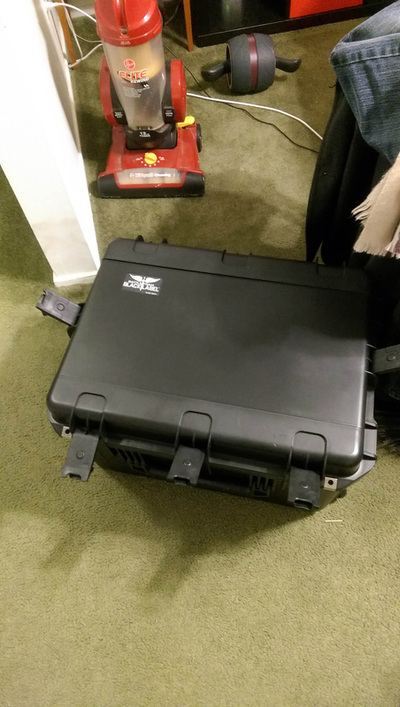 So I searched for the largest single check able piece of army luggage I could find. 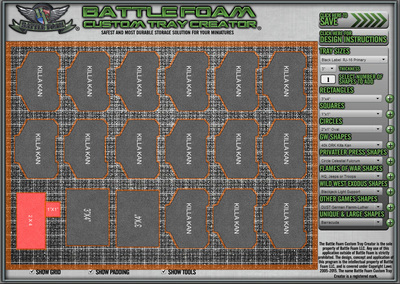 I found the RJ-16 from battlefoam. Here is the product link, if you want to know the actual specs. The RJ-16 is a very expensive case. There is a reason for this. It is built like a tank. They show off many different ways they test the case, but let me tell you, nothing they do is compared to what happens to your luggage at the airport. 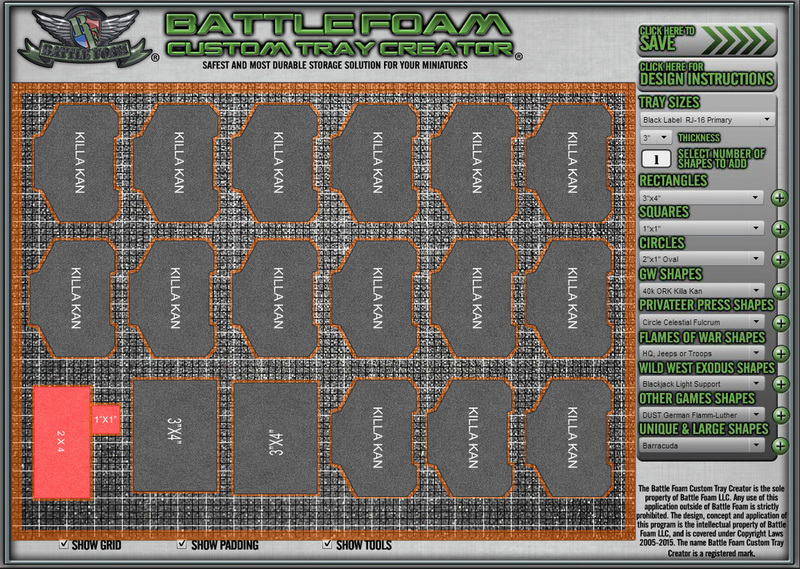 The battlefoam case is a custom loadout, which allows you to use their tool to cut out the shapes (many of which they have in their database) and lay out in the case in the most efficient method possible. I set my three layers up like this. 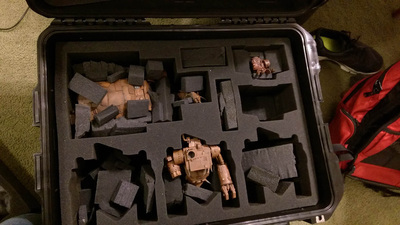 The top layer held the stompa, mega dread, gorkanaut, two deff dreads, and spot for a third gorkanaut. 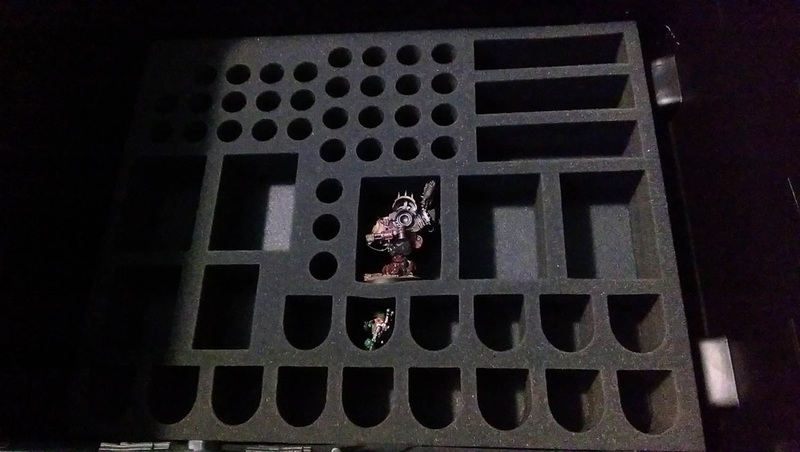 The second layer was setup for 15 killa kans, and the bottom for a host of misc stuff (20 mega nobz). 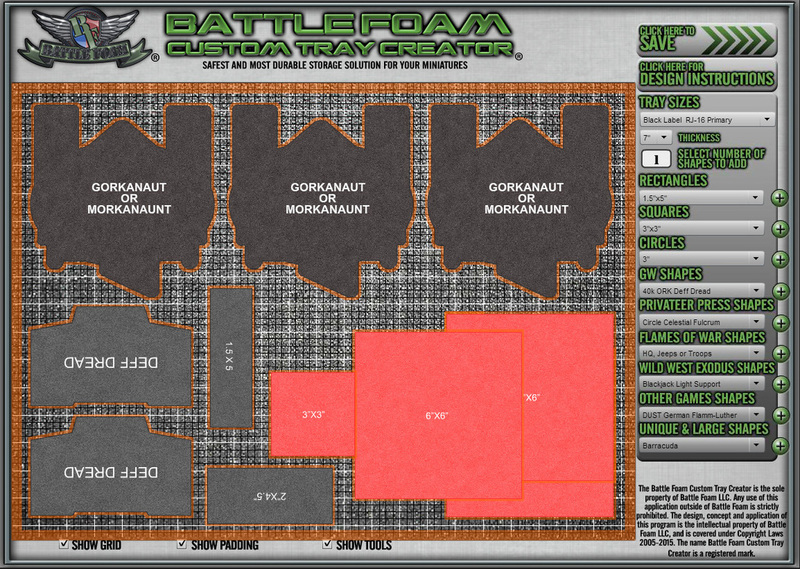 After you set up the cutouts, you determine their thickness based on the models you will put in them, place the order, and they get to work. About a month later, you'll receive the case in the mail...it will be gigantic. To call it impressive is an understatement. 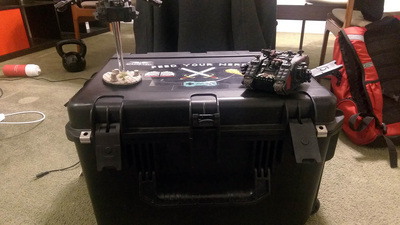 The case includes a number of wicked cool transport features. It has some crazy heavy duty locks, thick wheels, and most importantly, an extender so you can easily cart it around. 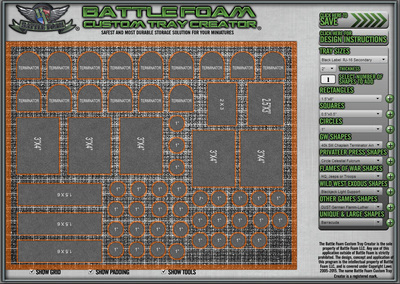 When you open it up, the foam is thick and sturdy, and the top layer includes foam inserts for all the cutouts, which become insanely useful as you'll see later. 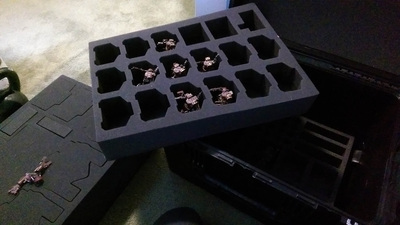 Putting the models in the case, they all fit great. I did encounter an issue of my own causing though...I made the depth for the stompa, and not the deff dreads and gorkanauts...it was way too deep! But that was easy to fix! 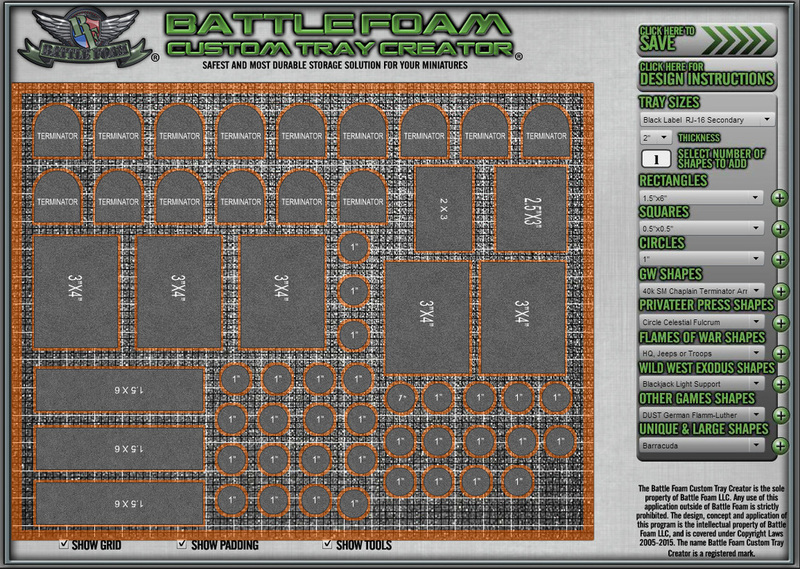 Just cut up the extra foam bits! I used the case to take the walkers to a few local games (sincain40k's, and FYN's), and was really happy with how well it kept everything secure. But I was still a bit worried about actually checking it in as luggage. So using the extra foam included, I was able to make custom spacers for all my pieces, so that every walker was extremely snug in it's space. 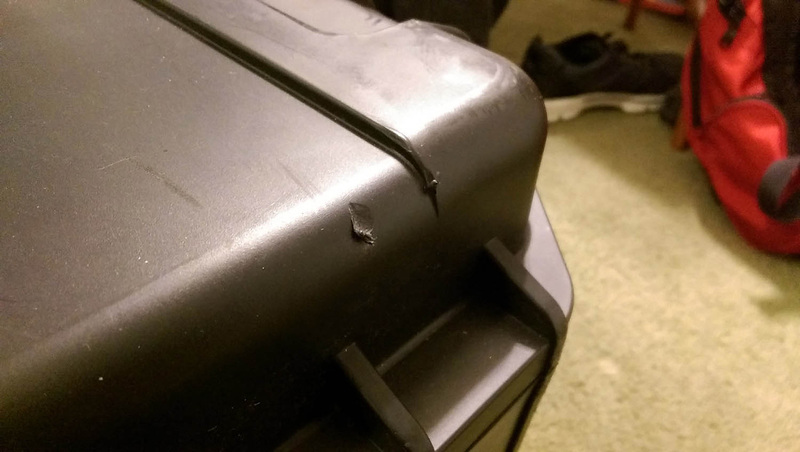 I did this because I figured checking your luggage is roughly equivalent to chucking your army case down a flight of hardwood stairs...multiple times. 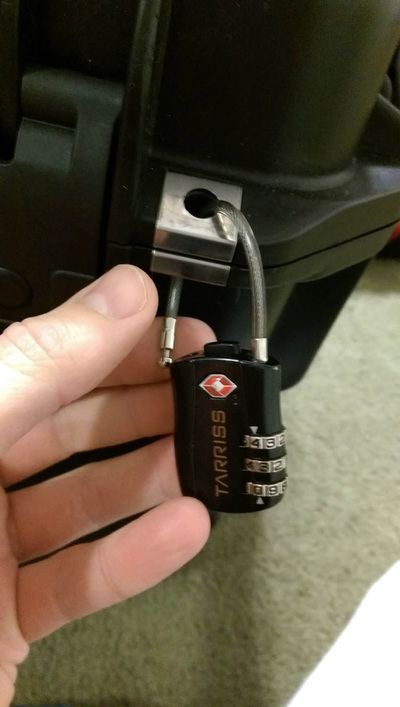 So I wanted to be damn sure it was protected! 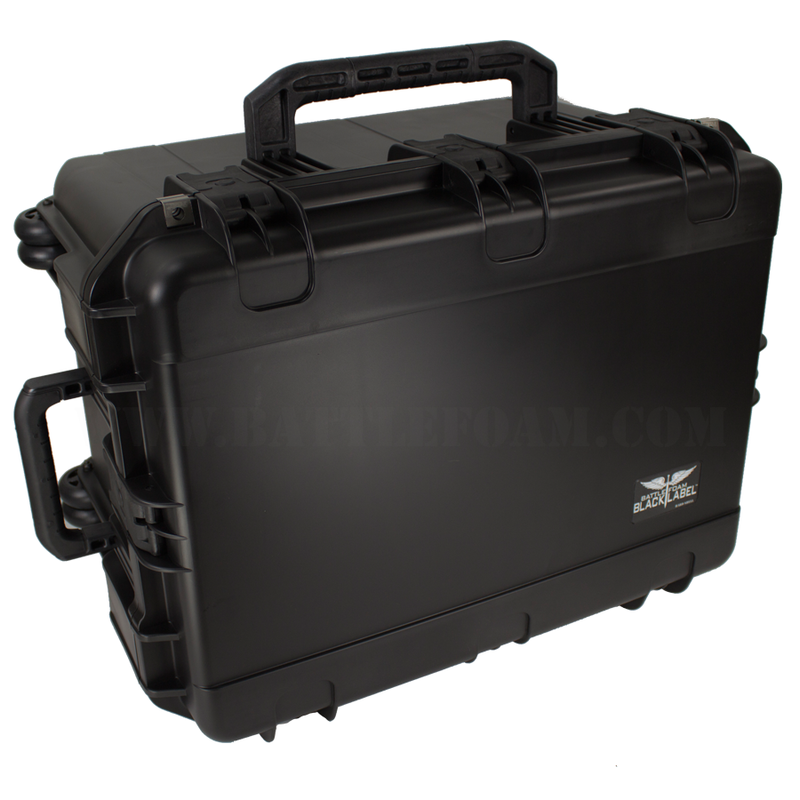 So the day came, and everything was packed as secure as I could make it in the battle foam RJ-16. 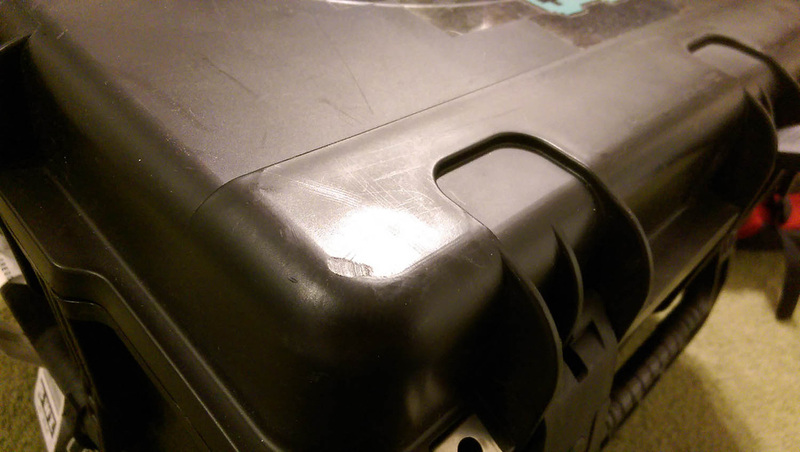 I got two TSA locks for the case, took it to the terminal, and checked it. 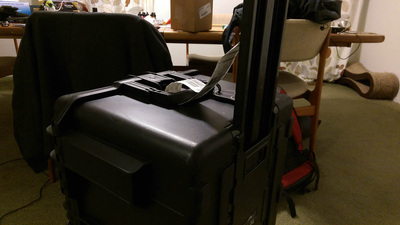 It was "just" under the over sized limit for baggage under southwest regulations. They checked it, and thus began the waiting and wondering. Upon landing in Vegas, I awaited with apprehension at the baggage claim...until it stopped turning, and my bag was still not there. Sweating bullets, I started looking for someone to find out what happened, to see someone carting it down the aisle. Turns out, even though it wasn't charged as oversized, they placed it somewhere else because "it looked like weapons". Back to the hotel, and quickly opened...everything was ok! It made it! There were a few minor injuries though. 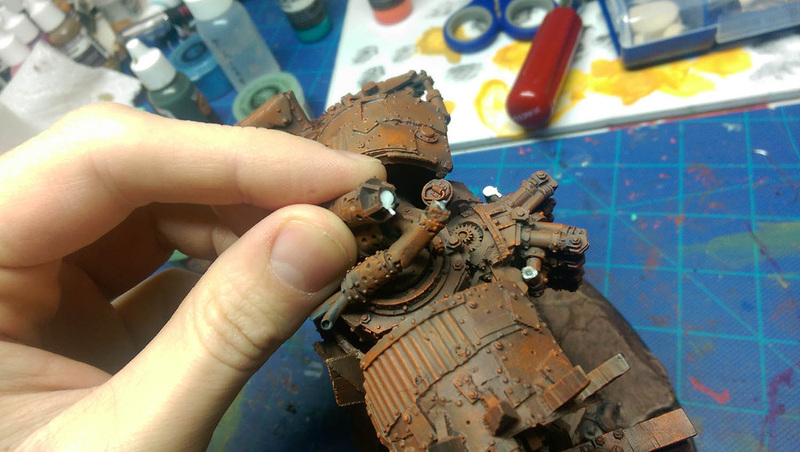 A few exhaust bits on the deff dread and megadread popped off. 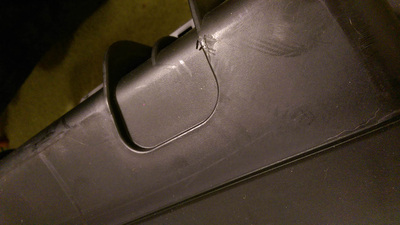 But that was the extent of the damage...and something that happens just playing with them on the table top! I was estatic. The case itself took some damage, and had some gouge marks in the plastic, and a few dents. It was NOT nicely treated. 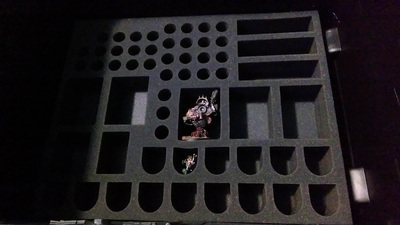 But this was just stage one...all weekend I used the case to cart my army around, getting better and better at arranging it for maximum ork walker dispersal! But the trip was too short, and back home I went, to undergo the entire process again. Once again, wasn't charged for oversized, but it didn't show up on the carousel. You had to pick it up from the special section. More gouges and dents, with one of the lock clips bent this time. Do they just toss things straight off the plane into the ground? 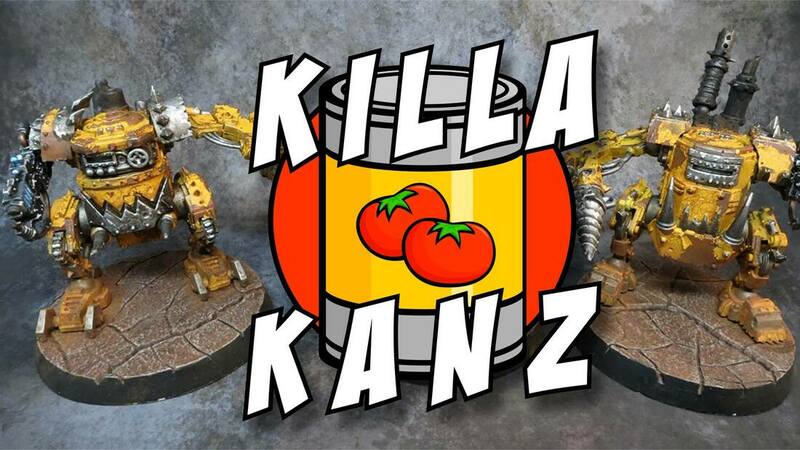 Once again, back home, opened her up...damage was extremely minimal (same exhaust bit popped off again (i need to repin them)), and one of the killa kans popped off at the ankle (easy fix). 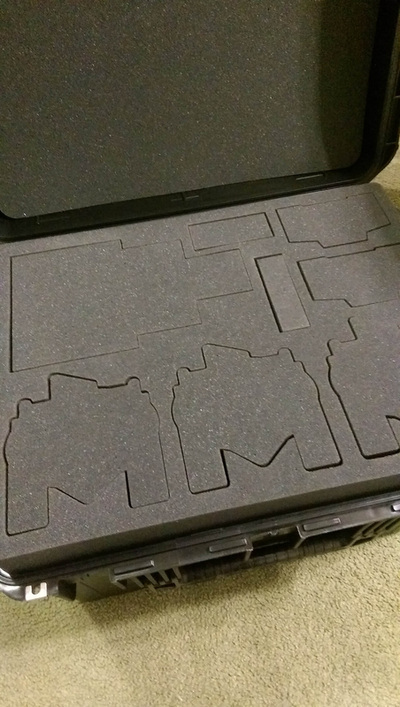 All in all, extremely impressed with the durability and protection the case offered. I don't think there is ever a better trial by fire for a army transport case, then checking it through luggage twice :). Hope you liked the review! If You have any questions, leave them here, and I'll do my best to answer them. "Greetings all, welcome to our break down of one of the most anticipated Games Workshop accessory releases - The new Citadel Crusade Case. 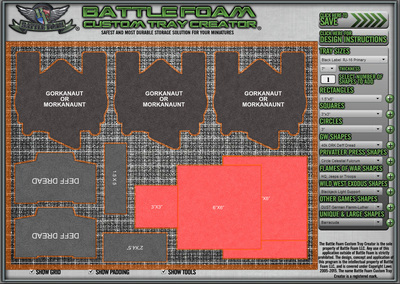 Boasting capacity of 400 figures and new 'innovative' foam design, the accompanying video with this release, created a surge of positive remarks concerning GW's progression in non-miniature products at a some what competitive price point. The question is, is it any good?"